I heard on CBC the other day that there will be a Heritage Chicken Tasting event at Hôtel Le Germain, hosted by Slow Food Toronto. What are heritage chickens you ask? They are the breeds of chickens from long ago that actually taste like chickens. In chicken farms nowadays, there are basically two types of chickens: one for their big oversized breasts and one for their year round egg-laying. Not too much varieties. At this tasting, you’ll be able to try the Jersey Giant, Buff Orpington, Barred Plymouth Rock, and Americauna chickens. Apparently, the Jersey Giant was bred to be large like a turkey. You can buy tickets from U of T tix website. We’re a little late on the notice here, but there are 18 different strawberries festivals taking place in Ontario this weekend! Check out this website for more details – you can still make it on Sunday. There’s a free green event at Mel Lastman Square on June 19-20, hosted by Enlightened Events. At the EcoSavvy Festival, you’ll learn all about the local green and responsibly made products and services. There’ll also be live music, organic food sampling and DIY workshops. Visit their website for more information. The ratio of sap to syrup is 40:1! Maple trees are one of only four families of trees in Ontario that have opposite branches (i.e., branches and leaves come off the main stem in pairs on opposite sides of the stem). M.A.D. Horse is the way to remember these trees: Maple, Ash, Dogwood and Horse chestnut. Tanny and I loaded up on maple sugar and maple almonds from their sugar shack. Ella was mesmerized by the pony ride but was a little too scared to get closer than 3m away. The festival runs until April 13, 2009. Tanny, Ella and I went down to Seedy Saturday and picked up this year’s crop of veggies. Seedy Saturday was held at the Wychwood Barns this year and it was PACKED! This weekend we started all the tomatoes, the basils, the thyme and the peppers. In a couple of weeks we’ll start the melons. The rest we’ll plant directly outdoors. I’ve already started getting the yard ready for spring. I cleaned up the leaves and debris from our East and South yards (sounds bigger than they are) and some green flowers shoots are already peeking through! We had a nasty infestation of Viburnum leaf beetle that stripped both our snowball trees last year so I’ve been painstakingly pruning all the infected branches. This year we’re going to convert one of our flower gardens into a vegetable garden since our current vegetable garden is really shaded. We’re also hoping to plant a second fruit tree (to replace a fallen tree) and some Veestar strawberries. It absolutely breaks our hearts to know that we have to clip the flowers from the strawberry plants the first year and won’t get strawberries until 2010! If anyone has a recommendation for a native fruit tree that doesn’t suffer from neglect and insects but has a plentiful yield – please let us know! Tanny and I have been a little buried with our day jobs (which have recently extended into evening/night jobs) recently so we’re a bit behind with our posts. We’re on vacation currently so the site will get some more attention in the coming days. As we had written previously we were fortunate to be invited to this year’s inaugural EcoSuave fundraising event. 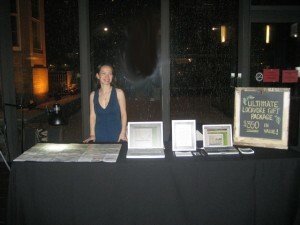 We had a table set up with two laptops connected to localeating.ca and hosted a video testimonial to local eating. Tanny and I had a GREAT time. The event was very well organised, with a lot of yummy local food and a lot of very friendly guests. It’s the first time we’ve ever actively promoted the site and it was fantastic to get feedback from people. I hope some of you found your way to our site after the event! The video testimonal was setup as a way to enter a raffle for a wonderful gift basket of sustainable goodies. We’re planning to release the video on our site once it’s ready, but due to the excitement and energy level in the room it’s pretty difficult to hear many of the speakers on the video so I will be captioning them before I post it. Josh and I have our outfits picked out and all ready for ecoSuave2009. We feel very fortunate to be asked by the organizers to attend this event. We’ll have a table there to talk to people about eating locally and a special activity that will get you entered into a draw for some awesome prizes. The whole event sounds like fun – there is live jazz and an array of food prepared from local ingredients. The food will be set up at sampling stations and is included in the ticket price. Check out the Enlightened Events website for more details. If you’re in Toronto, maybe we’ll see you there! Even though we’re still in the middle of winter, last week’s (almost) spring-like weather is a gentle reminder that spring is coming. It’s time to head to your local Seedy Saturday/Sunday to swap and buy seeds, attend workshops and get inspired to grow your own food. I am obsessed with the heirloom tomato varieties and can’t wait to buy more unusual tomato seeds. After eating only Ontario garlic this past year (it tastes so much better, a milder taste, not pungent at all), I’m inspired to try growing my own. 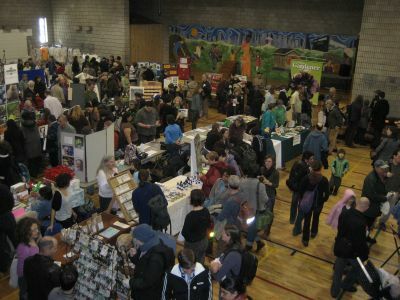 The Seedy Saturday in Toronto is on February 28 this year, at a new location – the Wychwood Barn. The theme this year is potatoes. Here’s a list of Seedy events in the next month in Canada. Holiday Inn on Prince St. There are a couple of events happening in Toronto related to local eating and organic food. An evening of live jazz music and local food and drinks. The purpose of ecoSuave is to raise awareness about local and sustainable food production. Sounds like a fun way to mingle with like-minded people. The $20 ($18 online) ticket includes samples of food and drink. For more information, visit Enlightened Events. A one day conference on sustainable farming, benefits of organic food and the latest research on organic food. A great forum to learn more about the science behind organic food. The $65 ($85 after Jan 30; $55 for COG members) ticket includes an organic lunch. For more information, visit Canadian Organic Growers. Tanny is finished her maternity leave and is busy writing lesson plans so I’m handling the blog tonight. 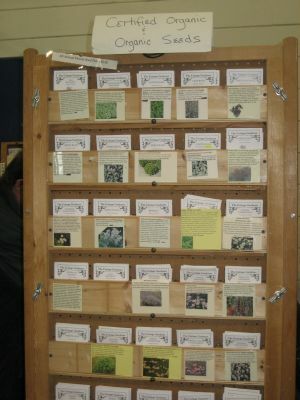 This weekend we all headed down to Seedy Saturday in Toronto. It was the first time for all of us and I was really blown away by how many people were there and the variety of vendors. We saw some familiar faces from the Dufferin Grove Market – the people from whom we buy our perogies and the sprouts guy and many other organic activists and entrepreneurs. We thought the stuff at the You Grow Girl booth was pretty clever and cute. She has a well written and established blog as well (as I write this I just noticed she also has a post about Seedy Saturday). Did I mention there were a lot of seeds for sale? We talked to a guy from Seeds of Diversity. 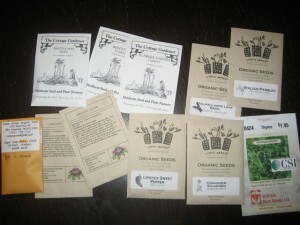 A very interesting project that is cataloguing, preserving and distributing heritage Canadian seeds. For a small donation we picked up a packet of Blanche Beaute tomatoes. I had a very interesting chat with a women who was campaigning against terminator seeds. I must admit to being in the dark about the issue before and I’m determined to find out more information now. The quick summary from my conversation is that seed companies are creating GM seeds that will be sterile after one harvest. The upside for the seed companies is that people need to continue buying seeds year after year. You can imagine the effect of this on 3rd world farmers. For me the issue has similar ethics to big pharmaceutical companies patenting drugs. Yes, they need to be paid for their research, but at what cost? And seriously – didn’t they watch or read Jurassic Park? Those dinosaurs were supposed to be sterile as well! For more information (on terminator seeds, not Jurasic Park) see this link. Tanny has ballet class on Saturday so we split our visit to the show into two (with lunch at Magic Oven in between). Unfortunately we didn’t get back until 2:30 and had only 30 minutes to dash around finding seeds we wanted to buy. These carrots are 7″ long, 2″ wide. I grew really stubby carrots last year so I’m hoping for big ones now. As Tanny just mentioned to me, “we forgot we have a 5×5 plot”! We also learned that “sweet peas” are not the same as “sugar peas” and are in fact toxic. My farmer roots are not showing here. No pun intended.